Coeur de Paris - the Heart of the Historic, Charming, Latin Quarter. One of Paris's oldest and most famous neighborhoods, once a part of the Roman city of Lutèce. Here you'll find ruins over 1,000 years old, as well as a bustling and chic Parisian hub frequented by intellectuals and art lovers. Le Lutèce is minutes from the always stimulating Rue Mouffetard, with numerous, restaurants, cafés, shops and fresh markets for veggies, fish, and meat-always open! There's also the Place Monge, with its landmark stone fountain at its center, and an enormous Open Air Market 3 days a week. You'll be down the street from the elegant Jardin du Luxembourg, Jardin des Plantes, with zoo and exotic plant greenhouse, Le Pantheon, St Michel, Rue St. Jacques, the Seine, the Sorbonne University, and Notre Dame! Museums are within walking distance in every direction. 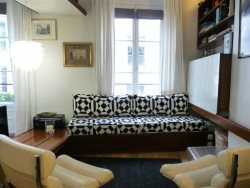 Le Lutèce offers modern comforts (recently renovated) as well as a delight for the senses of those in search of Parisian Charm and Classic Haussmanian Style--10 foot ceilings, beautiful moldings, parquet floors, marble fireplaces, etc. The apartment is on the 3rd floor (4th floor US), with elevator, and you enter through a spacious Foyer, which allows access to the fully equipped, modern and rustic kitchen--oven, microwave, dishwasher, stove top with 4 burners, large double sink and a bar with stools for a quick café and croissant in the morning. The large Salon, with Versailles style parquet floors and marble fireplace, has a cozy dining area, and a comfortable sitting area with a convertible sofa. The expansive second bedroom has a corner window, marble fireplace and 2 single beds - which can be joined together to make a queen bed. There is the possibility to add a single mattress on the floor, so that three children could sleep in this room. In the second bedroom, there is also a sitting area with leather sofa and armchair. The bathroom is bright and has a large walk in shower with emerald, mosaic, glass, Italian tiles, rain style shower head and a large counter for the sink. The toilet is separate, and allows for no waiting while others prepare themselves in the bathroom. There, you'll find a washer and separate clothes dryer. The apartment is equipped with High-Speed WiFi, cable TV channels, and Free Long Distance phone calls. You'll be surrounded by Metros and Buses, to transport you to all the historic sites in Paris. You'll also be walking distance from 2 RER stations that will whisk you to and from the Airport. Le Lutèce will transport you to the elegant past of the City of Lights, while keeping you firmly planted in the thrilling Paris of today!